A false argument can become an established truth by a process of constant repetition. But it is still false. This is now the main method used in the ongoing debate about the effects of immigration to the UK. One of the key false assertions widely made is that immigrants have driven down wages. Chart 1 below is based on a TUC analysis on the effect of the recession on real wages in selected countries. Contrary to Government propaganda, the UK economy is not booming. On some measures it is among the worst-performing countries coming out of the crisis. 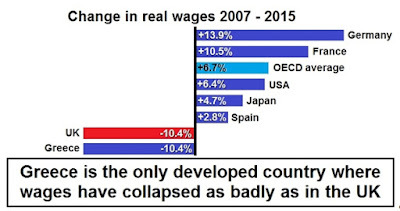 By contrast, while there are many other advanced industrialised countries that have been badly hit by the crisis, only Greek real wages have fallen as far as those of British wages over the period 2007 to 2015. This collapse in UK wages has coincided with the continued growth in net migration to the UK. But coincidence is not even correlation, let alone causality. In reality, no-one outside the far right ever dreamt of linking wages to immigration levels until the Tory Government introduced a net migration target in 2011. This was a blatant attempt to distract from its own unpopularity because of its austerity policy. Labour had started to pull ahead of the Tories in the opinion polls for the first time in 4 years (data here). Blaming migrants for low wages, poor public services, the housing crisis and other issues is classic scapegoating. The assertion that migrants drive down wages rests on general truisms; that migrants are willing to work for lower pay, they undercut wages and so on. If any of this were true, it would be generally true. There cannot be a unique mechanism which only applies to the UK which does not apply to other advanced industrialised countries. Yet this is one of the more obvious ways in which this argument falls down. 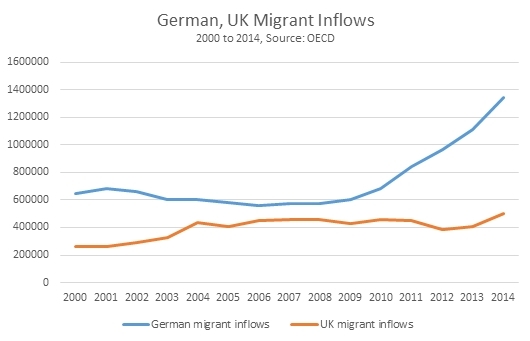 In Chart 2 below the total level of migration to the UK and to Germany from 2000 to 2014. It should be noted that over the period 2007 to 2015 German real wages rose by 13.9% while UK real wages fell by 10.4%, as noted in Chart 1 above. 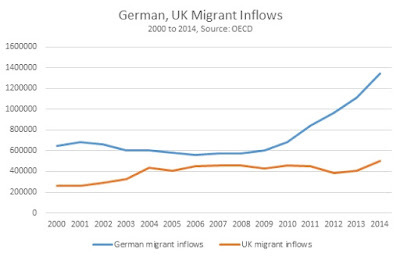 Yet this is almost exactly the period in which migrant inflows to Germany and to the UK diverge dramatically. In effect, just as German real wages were advancing migrant inflows were soaring towards 1.4 million per annum. At the same time, while UK real wages were declining the level of migrant inflows was more or less steady at approximately 500,000 per annum. As a proportion of the total population German migration was also much higher than that of the UK. If the general proposition were true that migrants drive down wages in advanced industrialised economies, it would be true across those economies. It is patently untrue. German wages rose in real terms while its immigration rate and totals were far higher than that of the UK. In reality, the German economy is a much more highly productive economy than the UK, about 30% higher. This is based on much greater openness to the world economy and much higher levels of investment over a prolonged period. This allows both higher wages and higher wage growth than the UK. It is the exceptionally low level of UK investment combined with the economy’s long-term structural weaknesses which have caused the depth of the crisis here and the fall in real wages. Migrants have not cut British wages. British bosses have. Royal Bank of Scotland (RBS) is a publicly-owned bank. The overwhelming majority of its shares are in state hands, 73% of the equity. Yet it was the only major bank to fail outright the recent ‘stress test’ of its balance sheet conducted by the Bank of England. The bank is a basket-case. It is costing all of us money, and yet it could be a key contributor to economic recovery. For many years the left has called for the nationalisation of the banks. This happened as a result of the financial crisis. But with very few exceptions the left had very little to say about what the public sector could do with its newly-acquired and deeply damaged assets. That was an error. Now that the left leads the Labour party and could be in position to lead the next government, it should use every lever at its disposal to produce an investment-led recovery. RBS should be seen as one of those levers. The financial position of RBS is deteriorating, highlighted by the Bank’s stress tests. The stress tests themselves have four fundamental elements, related to the earlier global financial crisis. 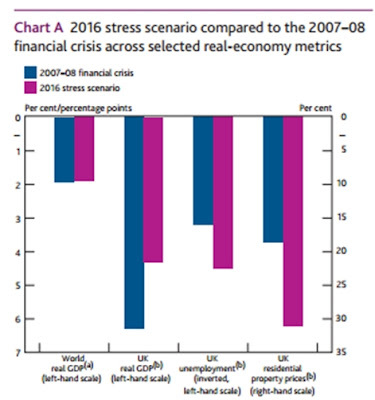 In the Bank’s stress scenario, world GDP falls by the same amount as in the global financial crisis and UK GDP falls by a lesser amount. But UK unemployment rises more than previously and UK property prices fall by a significantly greater amount. 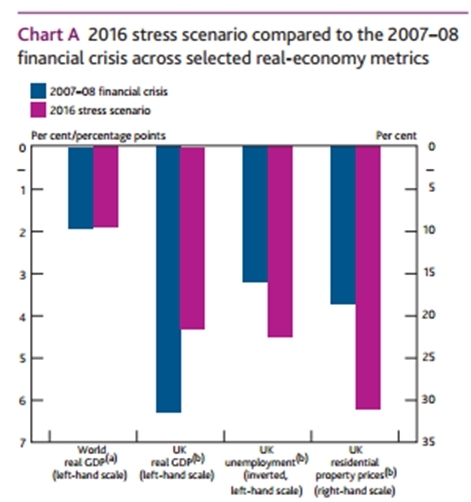 The stress test assumptions compared to the global crisis are shown in Chart 1 below. The specific problem for RBS is revealed by this fundamental test. RBS is a loss-making bank, incurring a pre-tax loss of £2.7 billion in 2015. But it is also particularly unprepared to withstand a downturn in the housing market. This is despite the fact its so-called capital cushion against losses has increased. In 2010 its Tier 1 capital ratio was 10.7% while in 2015 it had risen to 15.5%. This is a startling outcome, which completely belies the idea that banks can be insulated against shocks simply by increasing their spare or cushion Tier 1 capital. These are economic shocks outlined by the Bank of England, with perhaps severe financial consequences. The answer lies in economic policy, and its financial implementation. RBS has become a more risky bank since the crisis, not a less risky one under its private sector management even while it has been in public ownership and its Tier 1 capital ratio has risen. This is because it has increased its dependence on lending to the housing market. Between 2010 and 2015 RBS increased mortgage loans on its balance sheet from £90.6 billion to £104.8 billion, and the proportion of its total balance sheet from 83.6% to 86.4% of the total. This completely lop-sided dependence on mortgages means that any projected decline in house prices has an even greater damaging effect on RBS’s balance sheet than previously. RBS has in effect been cutting its lending to the productive sectors of the economy from already abysmally low levels. Business loans now account for just 4.4% of the total RBS balance sheet. Of course, if private sector businesses are unwilling or unable to borrow for productive investment then it would be foolish for RBS or any bank to chase business by offering uncommercial business lending. But thankfully, even in the UK, there are large parts of the economy which are in public sector hands and which could easily increase their productive borrowing for investment. These include local authorities and universities. There is too still a host of companies in public sector hands. Local authorities own, or have significant holdings in a series transport networks, bus services, rail networks and even airports. In addition, they could all usefully increase and upgrade local authority housing. Universities own research facilities and share in science parks which can be expanded. They own publishing enterprises, which could be upgraded and digitised. Large scale companies remain in public hands, from broadcasting companies, to research facilities, the NHS, the Post Office, water companies, network rail and air traffic control. All of these could be expanded with investment and in the process would increase the level of productivity and prosperity for the economy as a whole. The publicly-owned National Grid could undertake its own large scale investment in renewable energy projects. The return on them would be on average very high, and RBS itself would be rebalanced away from the housing market. The Tory government has presided over the longest fall in living standards in the UK on record. It has produced the Brexit car crash simply in order to manage its own internal divisions. It is utterly incapable of lifting the economy out of its morass. Inevitably, it has no idea how to lead RBS out of its crisis. The only reason a fire sale has not been conducted is that outstanding legal cases, primarily in the US, mean that some parts of RBS are still burning. Labour cannot take its lead from the Tories on any of these issues. One of the most difficult tasks in politics is to arrive at an objective perspective on key issues, overcoming the weight of prejudice fostered by the enemies of workers and the poor. But RBS is a practical example of how the left must learn to think for itself, and use every lever at its disposal to deliver an investment-led recovery.